I found this adorable piece of paper in Rebekah's room the other day. Can you make it all out? 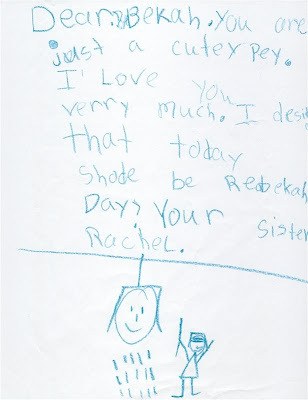 Dear Bekah, you are just a cutey pey. I love you verry much. I desid that today shode be Rebekah Day! Your sister, Rachel. Dear Bekah, you are just a cutie pie! I love you very much. I decided that today should be Rebekah Day! Your sister, Rachel. Isn't that just the most precious thing you have ever read? Wish they got along that well all the time. I'm not really sure what the picture is supposed to be, but the words just melted my heart. oh wow! You must be super mommy. Letters my kids write each other are not quite so nice. :) That is so precious though!!!!! The picture looks like a pinata...maybe Rebekah's head??? and candy coming out of it after Rachel hits it??? Ummm...maybe these words aren't as sweet as you THINK they are!